Colombia are intending to join the race to host the 2014 World Cup. The competition is to be held in South America as part of Fifa's rotation policy and countries from the continent had decided not to bid against Brazil. But Colombia, who pulled out of hosting the 1986 World Cup because of financial difficulties, have broken ranks. 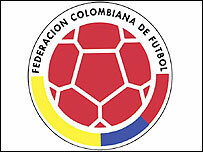 Colombia Football Association president Luis Bedoya said: "We have presented the letter of intent. We know it's going to be a long, tough road." Mexico stepped in to host the tournament in 1986 when Colombia pulled out two years before the start. They hosted and won the 2001 Copa America tournament which was initially postponed before going ahead amid security concerns. Brazil are still set to be favourites to stage the tournament but Fifa president Sepp Blatter has said that no country will get the tournament unless it is deserved.